Decorating a horse with unlocked accessories. 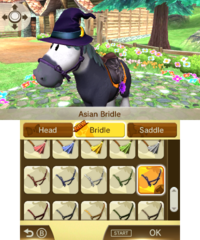 This article is a list of all available horse accessories in Mario Sports Superstars that players can decorate their horse with. These accessories are split into three categories: Head, Bridle, and Saddle, and each set of each series has five different colors available. When players find ? crates on the field in stable mode, they can potentially unlock an accessory. Initially, crates with rabbits on them contain rare accessories themed after a set, such as the Gorgeous Saddle, Gorgeous Crown, and Gorgeous Bridle. Players can also find accessories when they go on an outing; the rarest accessories are themed after Mario characters, such as Mario's Cap, and all of these accessories are hats. Players can additionally unlock a special accessory when they collect 20 Mario Tokens, called the Mario Token Crown. These tokens are found when players find Little Birds sitting in the grass on the field, which occasionally to rarely appear. As time goes on, unlocking newer accessories becomes exponentially difficult, with the last set of accessories taking several runs through outings to possibly obtain. CPU characters not only pick a particular horse when they are encountered in horse racing, but they dress their horses with a certain set of accessories depending on the difficulty. Easier difficulty characters have little to no customized accessories on their horses, while the hardest difficulty characters decorate their horse with the complete set of rare accessories. This page was last edited on February 5, 2018, at 23:52.